I was contacted by a person who had a diamond given to her by her mother that provided quite a lot of sentiment for her. She asked that I design and make a ring of fairly simple yet contemporary design to accommodate her diamond. 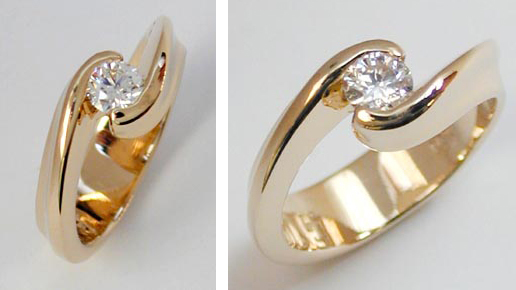 Pictures showing two views of the resulting 14 karat gold ring are seen to the left. Please feel free to click on either image to view larger pictures.